This elegant perfume opens on a powdery bouquet of Japanese chrysanthemum refreshed by the greenness of galbanum and reveals a precious heart mixing a feminine floral bouquet of rose, wisteria and iris, contrasting with a hint of bitter-sweet cocoa. The composition is underlined by the sensual and comfortable base made of patchouly, incense, vanilla and sandalwood. 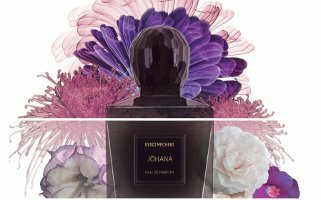 Keiko Mecheri Johana will be available in 75 ml Eau de Parfum. Wow! I’m in! I recently discovered Keiko Mecheri line with Iris d’Argent, Les Zazous and Damascena sent by a friend and I liked all three, they really follow my tastes. And bottles are lovely too! Hope you’ll like it then! This sounds like it could be something special! And I really love KM’s bottles. I’m really only familiar with Attar de Roses from this line (which I like very much) and have wanted to explore it more. Can’t wait to try this one! Could be! This line has gotten huge, I can hardly keep up. This sounds really interesting. I’ve been sampling Satori fragrances and have found most of them too oriental for me to wear. I like the sound of the combination of notes in this one though. Me too! These notes sound like they might work nice together. I think I mean to say they are too Japanese or geared towards Japanese tastes. I find most of them too light, subtle, incensy, transparent, discreet, understated, contemplative and very “wabi sabi” (wiki entry: http://en.wikipedia.org/wiki/Wabi-sabi). Being an epic floral lover, they are too sedate for me to want to wear, expect, perhaps if I’m attending a Buddhist service or a tea ceremony. The only one that packs enough punch for me is Black Peony. Satori EDP is a great scent for meditation. The parfum extrait I tried in the salon was heavier and gorgeous, but came with a hefty price tag too. Gotcha — thanks so much! cinnamon, clove, cacao, frankincense, sandalwood, oak moss, and Black Peony has bergamot, mandarin, orange flower, violet, geranium, sandalwood, musk, patchouli, amber, moss, vanilla. I haven’t tried any of this line. I see them at Kuhl-Linscomb, but there are so many of them and so many things to try that I just kind of feel overwhelmed and skip over them. This one sounds like it might be good though. I wasn’t sure about the “powdery” thing, but I’m a sucker for galbanum, and the rest sounds good. The line has really gotten huge, I sympathize.